The Town of Cicero unveiled a new memorial honoring American Military Veterans who served and fought at Pearl Harbor on Dec. 7, 1941. Cicero resident Joseph Philips Steffan was killed while serving on the USS Arizona, which today is a national Veteran’s War Monument. 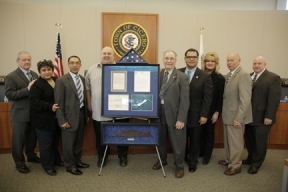 The Pearl Harbor museum donated a metal relic taken from the sunken battleship which was placed in a memorial display that the Town of Cicero Board of Trustees will soon permanently fix to the outside wall at the entrance of the Cicero Board Council Chambers. The USS Arizona relic is rare, but because a resident of Cicero served and died in the attack on the USS Arizona, the US Military agreed to provide a relic from the ship that could serve as a reminder of the sacrifice that American military veterans make to defend their country and citizens. “We are proud of Chief Petty Officer Joseph Philip Steffan’s service to his country. He made the ultimate sacrifice and we are honored to be able to remember him and all of the veterans who have served our country,” said Town President Larry Dominick.